Having a video for your next listing is one of the most important pieces of marketing in today's market. Over 70% of home buyers are using video as a primary way to view a listing. Not only will you stand out from the crowd, but your listing will too! Our professional pilots and camera operators know what it takes to make a house really shine on video and in photographs. Your potential buyers will be blown away by our aerial video and interior tours. Sell your next listing faster with Elite Air! * We realize that not every package may suit your needs. Please give us a call or drop us an email to see if we can get you a custom package and price! Are you FAA certified for aerial filming? Our pilots are FAA licensed Remote UAS Pilots. This license insures that each operator fully understands the rules and regulations when it comes to flying drones commercially. We also require that our pilots have at least 5 years of flying experience. All our current pilots have at least 10 years flying experience. Elite Air is fully insured with a million dollar liability policy. We can provide any documentation you need from our insurance company before a job. If my listing is near an airport, can you film it? According to FAA Part 107 it really depends on which airport the home is near. Elite Air will research each home you request and provide the legality of doing the job before we quote it. Rest assured our license is on the line every time we fly, we aim to fly 100% within the law. Does the homeowner need to approve the aerial filming? When we fly near anyone's home, we ask that they approve us operating around it. We just need a written approval from the home owner before flying. What about the neighbors privacy near my listing? We take every effort to maintain the privacy of a listing's neighbors. All the footage is focused on the property we are shooting and we will do our best to respect the privacy of anyone not involved. Currently standard privacy laws are the only thing that dictate aerial footage. We will do our best to mitigate any potentials issues with neighbors. If necessary, permission from neighbors is always a good courtesy. We also carry invasion of privacy insurance should the need arise. Rest assured that burden is on us. Not you as a customer. How long does it take for you to film a listing? Depending on the size of the listing and which service you select, we can be on site for as little as 45 minutes or as long as 2 hours. We will give you an estimate of time before any filming. 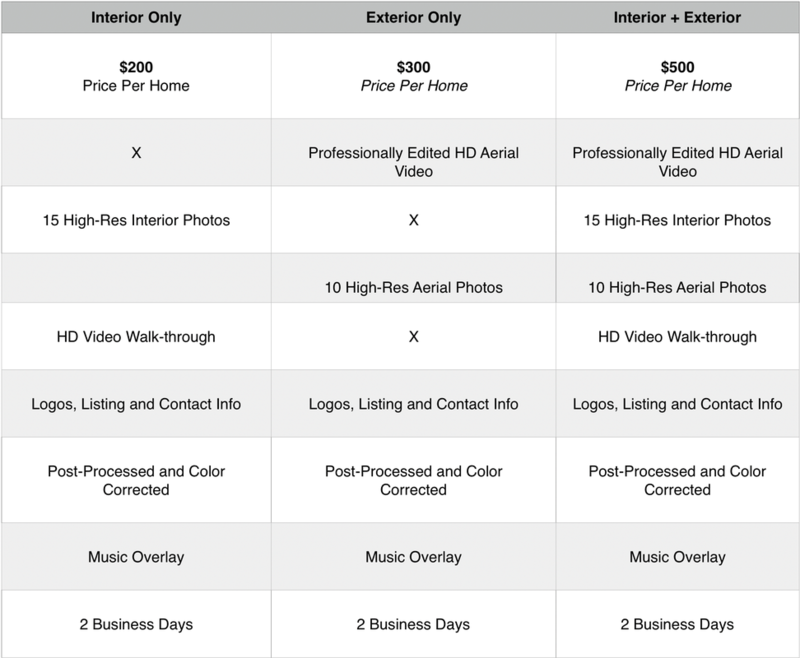 We always are looking to entertain bulk pricing if you have many listings that need shooting. Give us a shout and we can take a look at what we can do for you!